Written by: sarahwagner on November 2, 2018. When Charmed first aired, I didn’t watch it. I imagine there was a time conflict and there wasn’t an OnDemand option then because the show itself is right up my X-Files, Babylon 5, The Craft loving alley. I’ve seen the entirety of the original show now through syndication and I mostly enjoyed it. I was very excited to see what they would do with a reboot, especially one that changes the physical appearance of their main characters as that’s always touchy. It’s still on at a bad time for me as Doctor Who goes until 9:10 usually and there’s nothing more frustrating than coming to a show ten minutes late. Of course, this is why the OnDemand function and streaming is an excellent technology and more my speed. 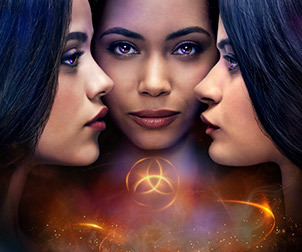 There could be some spoilers for the first two episodes of Charmed on the CW following the picture but I’ve tried to keep them to a minimum. The new show isn’t bad. It has a similar feel to the original in some ways and not so much in others. I actually prefer the setup to the new show, starting with a murder mystery. Then, we get the missing sister out of the way immediately instead of part way through the series (hopefully none of these actresses get pushy and need replacing – not sure they could do the replacing thing again). I have no problem with the change in skin tone or culture in this new iteration, in fact, I barely even notice except that none of these girls looks anything like Alyssa Milano (my fingers are still crossed that she’ll guest star). They’re still super cute though. It’s not perfect – nothing is. There are places it’s heavy handed and ham-fisted and the writers do not care if they offend you. There is a large swath of this country that will likely take issue with the show as it relates to the current political climate but there is also a large swath of the country that would applaud it. The fact is there are a lot of hot button topics in this country right now and it just isn’t possible to shy away from all of them and this show makes it quite clear where it sits without apologies. The effects aren’t exactly top-notch (but neither were they in the good old days). The house is different but still amazing and beautiful and dreamworthy. We live in a different time and having the representation of a gay sister is really great. At the moment, most things revolve around the college and given the ages of the sisters and their positions, that makes perfect sense. I love that one of the sisters is science-minded and working in a lab. Having the more typically girly stuff is wonderful too. You know they’re going to get in trouble trying to keep their “normal” life separate from their “witchy” life and keeping their significant others from finding out the truth (because that always ends well). There will be lesson of the week type episodes and monster of the week type episodes, but it looks like it’ll be fun enough to see where it goes and let the girls and the writers see if their little creation has the same kind of legs as the original. The biggest surprise for me was the reaction of the original cast. I would have expected the opinions to fall down different lines. Yes, I do think reboots need to slow down and networks need to focus on new and interesting things (but keep the genre stuff coming), but I don’t think reboots in any way cheapen the originals they are born from. My verdict: I’m giving it a chance to bloom and see what happens.